The way our cities are constructed and the sustainability of these choices are on the agenda. 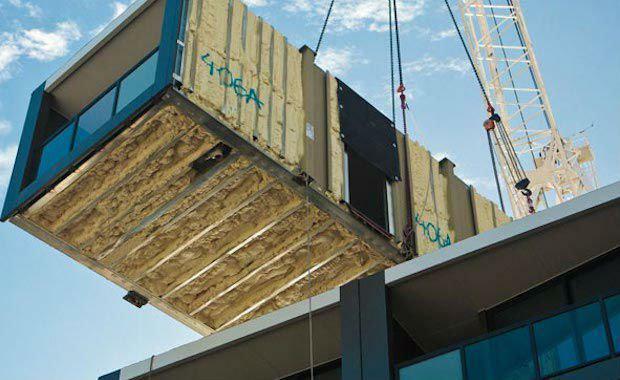 Prefab Australia (PrefabAUS) will assemble industry experts from around the world to address the global expansion of prefabricated building technologies and the future of Australia’s built environment. CEO of PrefabAUS Sarah Backhouse said that whilst off-site construction reduces costs and increases community sustainability, “an innovative, productive and quality local construction industry is critical to a more economical and environmentally sustainable future”. The inaugural conference will be held in Melbourne from August 11th to the 13th and will see the full spectrum of the prefabrication sector represented. With the off-site construction sector continuing to expand at a growing rate, “our conference is timed to bring together key representatives from all related areas for the first time; from architecture, engineering, manufacturing, material supply, property development and construction to universities, government agencies and client representatives,” said Ms Backhouse. The event will feature an influential line-up of national and international speakers and cover all approaches to off-site construction, from commercial to residential and across all key infrastructure sectors including health and education. Among the key speakers are Professor Peter Newman AO, leading author and environmental scientist, David Hodgett, Victorian Minister for Ports, Major Projects and Manufacturing and distinguished Australian construction director David Chandler. Responsible for the construction of Australia’s New Parliament House, Mr Chandler is conscious of the green economy and sees prefabrication as the way forward. “Australia’s construction industry has many competing agendas and until now very few of these have taken a national industry focus, prefabAUS is looking at the bigger picture,” Mr Chandler said. Under consideration during the three-day event will be both the commercial and residential approaches to off-site construction across key infrastructure sectors including health and education. Factory tours and site visits to the Docklands, Brooklyn and Salesian College will form part of a conference program that seeks to educate and engage attendees in a broader conversation and promotes the sharing of knowledge and resources. prefabAUS is the new peak body representing key businesses in the design, manufacture and construction of prefabricated buildings and building modules. It is a not for profit organisation and is hosting Australia’s first national conference on the off-site construction industry in Melbourne this August from the 11th to the 13th. The conference will feature 19 national and international specialists in off-site design, manufacturing and construction, as well as workshops, panel discussions and site visits. To get involved in the growing discussion follow prefabAUS on twitter (@prefabAUS) and tweet #prefabAUS2014 during the conference.